I’m fairly sure that the year was 2000. It was the 25th anniversary of us gaining access to fish the Hautu and Rangipo prison farms near Turangi. Almost exactly two years after Mt Ruapehu erupted and belched ash and nutrients into Lake Taupo via the Tongariro River. Following the eruption two once in 100 year floods purged the river of silt and flushed the nutrients into the lake where they caused another explosion, an aquatic explosion this time. The result of the increase in amount of available food and reduced competition was that the size of trout in the lake exploded to levels not seen since the 1920’s. Our last day fishing was in late May and it was arguably the most memorable fishing session in my angling career. As usual there was a cold start to the day. No frost but low single digit temperatures when we headed out to the car after an early breakfast. It was a typical winter day in Turangi. The weather was overcast but it improved slightly during the morning, especially whenever intermittent bursts of bright sunlight pierced the clouds. The Waiotaka River was clear but still running slightly high from rain that had drenched the Kaimanawas several days earlier. Perfect. Sandy and I had been allocated the Floodgate beat. 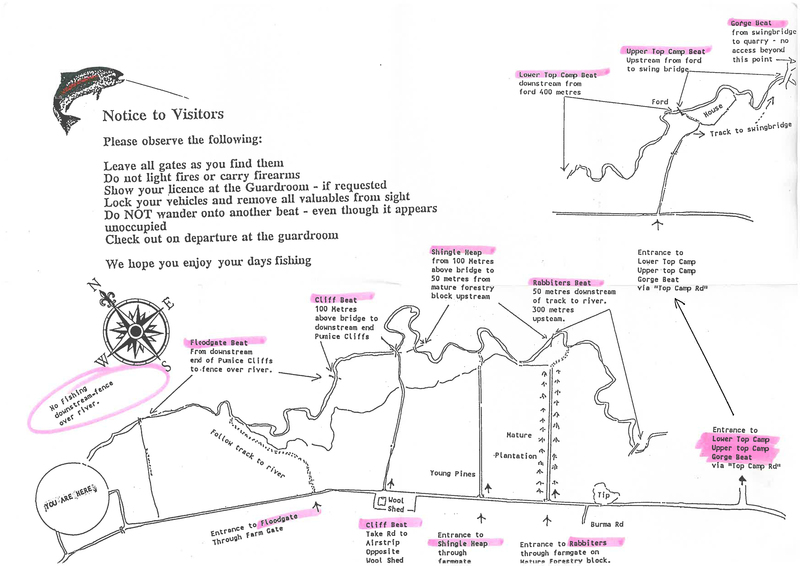 As you can see from the accompanying map this was the lowest beat in the farm. The Floodgate beat was characterised by few deep pools, mainly riffled stretches with deeper holes and glides, wherever the river turned a corner as it weaved its serpentine path across the shingle bed of the river flat. If the river ran low then the Floodgate held few fish and my father Ivan used to say, in his broad Yorkshire brogue, that it was “good looking nothing”. Extra water and the fish held in the beat longer and it could be very productive. We carefully negotiated several paddocks coated in heavy dew on way to where we’d park at the midpoint in the beat. Negotiating the gateways was tricky as they were both sodden and heavily rutted or worse, calf deep mud puddles the size of children’s paddling pools. Sandy and I tackled up at the car. We both knotted on a hare and copper bomb (#12) to point and attached a small ostrich herl nymph (#16) to a small length of nylon attached to the bend of the bomb. 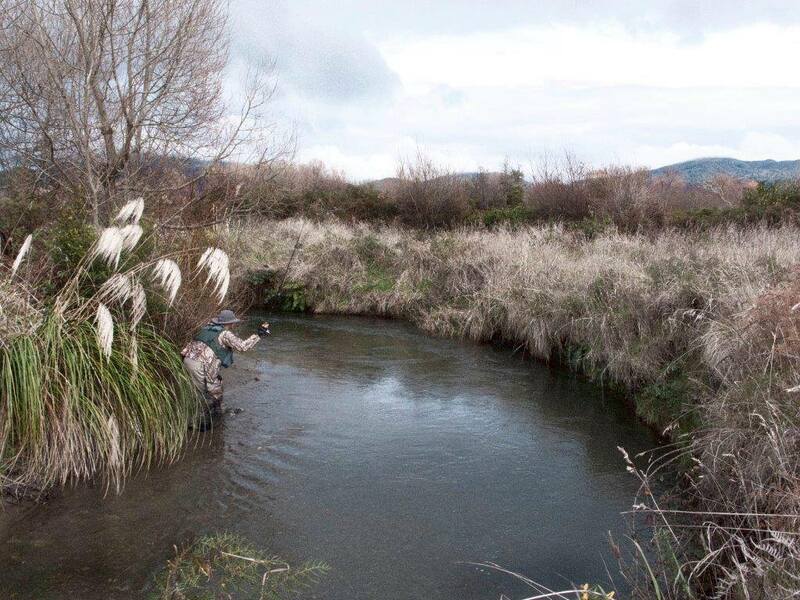 The ubiquitous “truck and trailer” rig that so characterises nymph fishing in the smaller Taupo streams. We were using 6lb. breaking strain Maxima tippet and without an indicator. I mention the nylon only because it had up to this day been bulletproof and served us well. Today would be different…. As we made our way between the blackberry and scrubby Manuka thicket en route to the river a pair of tui chortled and cackled away and a fantail followed closely behind picking up disturbed insects and threatening to land on our trailing rod tips. It was magic, ethereal even. 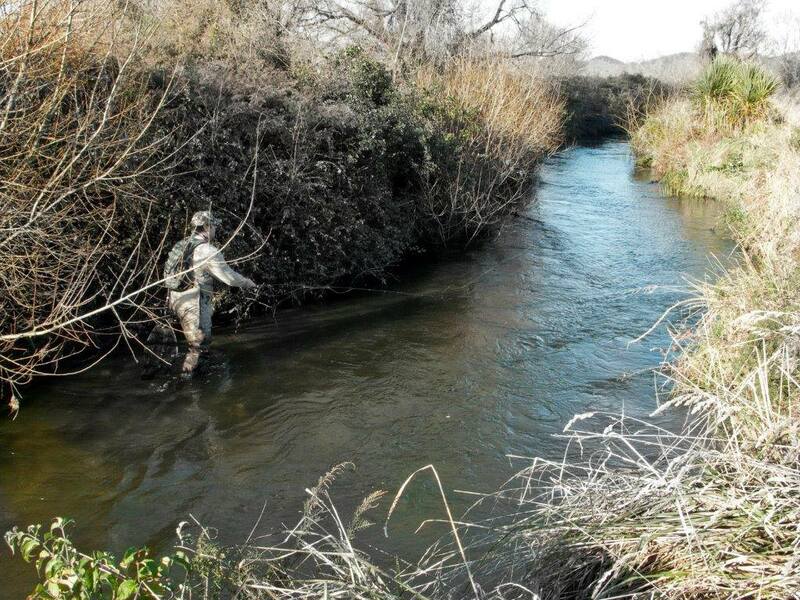 Our standard modus operandi was to head upstream initially taking turns to methodically fish all likely water. We knew from bitter experience that the river banks were undercut and that often they were crammed with trout, packed into the shadows like quivering sardines. You only discovered their presence as you waded upstream and they bolted, scattering all and sundry. The startled fish inevitably rocketed ahead alerting less observant brethren to the imminent danger. Extreme care was required and progress slow. The tail of the first glide was devoid of fish in the tail but a couple of trout were obvious finning and holding station in a small depression at the head of the pool. Typical, healthy 4lb. specimens which were pretty standard fare for the river. Sandy drew the short straw and got to fish first. She took time to get aim, pitched the nymphs in perfectly above the fish but they were disinterested. Seen it all before and had other things on their minds. She persevered for a while but the couple eventually grew tired of proceedings and slowly slid off under the bank. Next it was my turn. For me it was going to be one of those days as I lucked onto a much longer reach. I’d calmed down spotting for Sandy so I was in tune with the river by the time we hit the next run. I took my time and scanned it carefully. What I saw made me rub my eyes in disbelief. At least half a dozen large dorsal fins were evident in the shallows along the far bank. The water was calf deep so these were big trout, much, much bigger than normal. I slowly got into position behind the fish at the tail of the run. My first cast landed perfectly with the trace propelling the nymphs about 6’ ahead of the closest fish. I allowed the nymphs to sink and had one eye on the fish and the other on the end of the fly line as they drifted downstream. There was no hesitation. The fish moved to intercept, the line twitched and I struck. The rod came up solid into a deep arc. Game on. 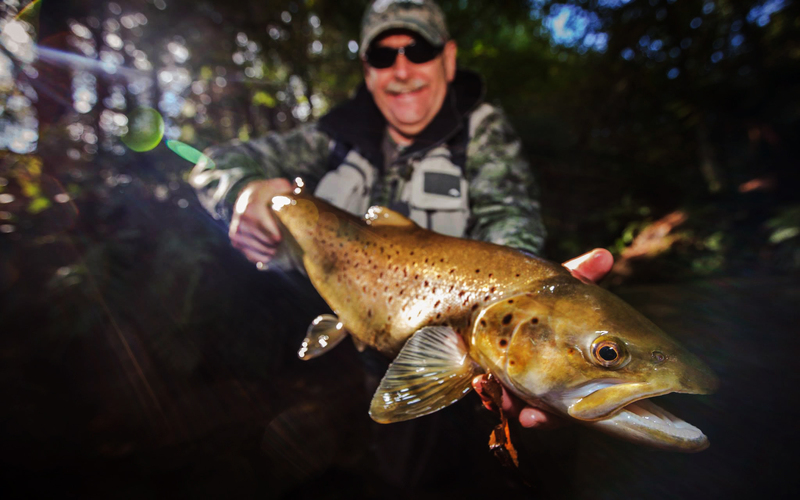 The trout took to the air and it was massive, broad across the shoulders and deep in the flank. Jumped would an overstatement. It was more of a sideways flop with an aerial component as it struggled to propel its impressive bulk out of the water. It was huge, double figure huge. Bigger than anything that I’d hooked before. It took off upstream in a withering burst before broaching again. Then it went to the bottom and held station trying to use the current to prevent itself from being drawn shoreward. I applied side, as much as you dare with 6lb tippet, and started to gain some traction until it felt the stony bottom in the shallows and sped off to regain its position close to the far bank. After 15 minutes my forearms were burning and wrists were throbbing under the strain. Then tiring of the game it took off downstream apace with me in hot pursuit. Somehow I managed to get below it and temporarily stop it heading out of the pool into the rapids which were festooned with downed timber and blackberry tendrils. I knew where it wanted to go next so I had to try and seize the initiative. I told Sandy to grab my collapsible landing net, open it and wade into the head of the rapids to intercept it should it take off again. The net all of a sudden looked pathetically small, no match for what was attached to my line. I put on as much side as I dared and managed to draw the fish in close at the tail of the run where it broached in the shallows. Sandy saw her opportunity, charged in and tried to scoop net it out, hitting the nylon and breaking the trace in a single swipe. The trout feeling the sudden lack of tension flicked its hearth shovel sized tail and was off into in the fast water and gone in a flash. I was gutted and for a minute or two the air was blue, more at my mistake than at Sandy. I should have changed my trace up to 8lb when I saw how big the fish were as it would have allowed me to take the fight to the trout more aggressively. The good news was that there were still fish finning in the shallows so I changed the trace to 8 lb. and re-entered the fray. Again I managed to hook up first cast and was fast into another big trout (> 7lb) which proceeded to jump out of the water early in the fight and spit the hook. I checked that everything was OK and then re-entered the run to target the last pair of dorsal fins. The first cast was wayward but the second was perfect. Hook up! The fish stayed in the water, charging around the pool fairly tamely compared with the first trout and after a short struggle managed to beach it midway down the run. It was a solid jack of just under 7 ½ lb. The next run contained three or four decent trout. Sandy hooked and lost a good fish but dropped it as it jumped and careered off downstream. This activity spooked the rest of the residents so we moved on. Soon it was my turn again. I crossed the river to fish the pool from the true right bank and Sandy opted to stay and spot from the true left bank. The river headed into bank at 11 o’clock and was deflected out to 4 o’clock. There was nothing in the tail of the pool but there were half a dozen huge trout finning close to the lip formed by the eddy current. I crept close and pitched the nymphs into the rapid feeding the pool. Again I watched the tip of the fly line as it headed downstream and imagined the progress of the nymphs. As it passed the lip the fly line hesitated so I struck hard. The rod lunged downwards and all hell broke loose as another massive fish took to the air. Fortunately this fish was reluctant to leave the pool and started to do circuits like it was running around an athletics track. Round and round it went. Every time it reached the head of the pool and charged off downstream the fly line scraped down the length of a submerged trunk of a Manuka sapling and displaced a cloud of silt. How it never snagged will never know. Eventually the trout tired and allowed itself to be drawn into the shallows, spent. I then charged in, got my hand across the back of its gill plates and carried it out. It was a fresh run hen that weighed a massive 9 ¼ lb. A personal best which more than compensated for the leviathan I’d lost earlier. The next run was only fishable from my side so I got another bite of the cherry. You would not believe my luck though, hooked up into another good fish only to have it snag the trailing hook and break off. Four fish on, all monsters, and only landed two. What a morning! By now it was nearing lunch time and we’d nearly reached the upper limit of the beat so we retraced our steps back to the car and had lunch. Luckily our arrival back at the car coincided with a sunny spell. There had been enough sun during the morning to evaporate off most of the dew so we sat on a blanket near the car and devoured our hot soup and cold toast with relish. We were shrouded in an oasis of tranquillity, the only sound being the occasional haunting warbling of the aptly named grey warbler. After lunch walked to the bottom of the run and worked our way back to the car. The bottom run in the beat was a beauty. A deep gin clear hole, probably 12′ at the deepest point, formed when river abruptly changed direction. It entered the pool at 3 o’clock, hit a papa cliff and headed out at 7 o’clock. There was a shelf formed where the river changed direction. There were a phalanx of large trout lined up against the shelf, stacked six abreast and three deep. Sandy waded into the tail below them and cast up into the flow feeding the hole. As the nymphs dropped over the lip a fish moved to intercept, I yelled strike, up came the rod in a fluid arc. Fish on. Sandy managed to drag the fish away from the lip and it headed downstream in a hurry. Fortunately it turned before the rapids at the tail and jumped, circled and twisted its way around the bottom third of the pool for five minutes before throwing in the towel to lay panting and exhausted in the margins. It was a lovely conditioned 6 lb jack, a personal best for Sandy. We took turns and persevered in this hole for around 45 minutes, hooking four trout and landing two. Both of the fish I landed were silver bars weighing between 7 ½ and 8 lb whereas Sandy dropped another couple both when they managed to leave the pool and break off in the rapids below. Some of the trout we hooked were unstoppable, especially when they headed downstream or into the snags which festooned the river. Heading upstream it was not long before we saw a pair of smudges in a knee deep rapid festooned with drowned Manuka saplings. I managed to hook one but dropped it almost immediately as the line broke as I tried to stop it going under a snag. We slowly worked our way back to the car systematically spotting fish and pitching nymphs to them. In the afternoon they seemed to be holding out from the banks on the seam at the edge of the channel which delineated shallow and deep water. I managed to hook another three fish and land two in long shallow riffles. Both were well over 7 lb. Sandy hooked another couple and dropped them both as they headed into the snags, hooked up the free nymph and bust her off. It just was not her day. By the time we reached the car I’d hooked 12 trout and landed six for the day. The average weight of fish landed was 7 ½ lb. The largest was 9 ¼ lb. I did not land a fish under 7 lb. all day and lost a fish that would easily have topped double figures….at the net. It was truly unbelievable, a very special day. It was astounding that both of us bettered our personal bests in a session. Call it serendipity but this was to be our last day ever in the prison farm. What a way to remember a halcyon period in our angling lives! It was as if we were fishing in a highlights package. A day we’ll never forget.